Poland; bordering regions of Ukraine, Slovakia, Czech Republic; along the Belarusian–Lithuanian and Belarusian–Latvian border; Germany, Romania, Israel. See also Polish diaspora. This page contains IPA phonetic symbols in Unicode. Without proper rendering support, you may see question marks, boxes, or other symbols instead of Unicode characters. Polish (język polski, polszczyzna) is the official language of Poland. It is the most widely spoken Western Slavic language and the second largest Slavic language after Russian. In history, Polish was an important language in Central and Eastern Europe. Today, Polish is spoken by over 38.5 million people as their first language in Poland. It is also spoken as a second language in western parts of Belarus, Lithuania, and Ukraine. Because of the emigration from Poland during different time periods, millions of Polish speakers can be found in countries such as Australia, Brazil, Canada, United Kingdom, United States, and so on. There are over 50 million Polish language speakers around the world. There are 9 letters in Polish which English does not have. They look like English letters with marks above or below them. There are 3 English letters which are not used in Polish: q, v, x. There are 7 combinations of 2 letters which are like a single letter sound (similar to "th" or "qu" in English). These include "ch", "cz", "dz", "dź", "dż", "rz", "sz". 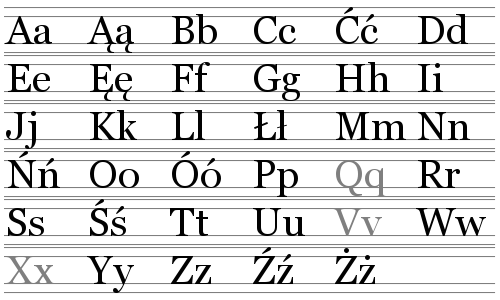 Many letters have the same sound in Polish and English, for instance "f", "m", and others. But other letters sound different, for instance Polish "w" sounds like an English "v", while Polish "ł" sounds like an English "w". There are also some Polish sounds which do not exist in English, and some English sounds which do not exist in Polish. The vowels "ą" and "ę" are nasal, which means people pronounce them blowing air partly out of the nose as well as the mouth. Most words are pronounced with an accent on the next-to-last syllable. For instance the Polish word "student" (which means the same as the English word) is pronounced with the accent on "stu" ("STU-dent"), while "studenci" (the plural form of "student") is pronounced with the accent on "den" (stu-DEN-ci). The Polish language has several dialects, but less so than most European languages. There are small differences in "standard" Polish, but all speakers can understand one another, and non-native speakers often cannot notice the differences. The grammar is complex, and has some features which do not appear in English. Like many languages, Polish has grammatical gender. A table (stół) is masculine, a book (książka) is feminine, and a window (okno) is neuter. Nouns and adjectives and verbs have many endings, depending on their role in a sentence. There are 7 cases or roles which a noun can have in a Polish sentence, each with its own ending. The endings also depend on the gender of the noun. Word order is more free in Polish, partly because the noun endings help people understand the role of the word. In English, "The boy bites the dog" is quite different from "The dog bites the boy", but in Polish people could use either order without confusion. Jak się masz? (yahk shyeh mahsh) - How do you do? Co robisz? (tsoh robish) - What you doing? Jak się nazywasz? (YAHK shyeh nahZYvash) or Jak masz na imię? (YAHK mahsh nah EE-myeng/EE-myeh) - What's your name? Jak dojechać na lotnisko/dworzec (yak do-YEH-khatch nah lot-NEE-sco/dvo-ZHETS) - Hot to get the airport/rail station? The oldest printed text in Polish – Statuta synodalia Episcoporum Wratislaviensis printed in 1475 in Wrocław by Kasper Elyan. The Polish alphabet contains 32 letters. Q, V and X are not used in the Polish language. Knowledge of the Polish language within Europe. Polish language Facts for Kids. Kiddle Encyclopedia.